Döveling, Katrin, v. Scheve, Christian & Konijn, Elly A. (eds.) (2011). 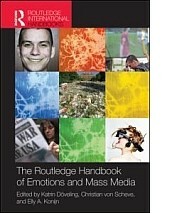 The Routledge Handbook of Emotions and Mass Media. London: Routledge, Taylor & Francis. The impact of mass media on individuals and society is to a great extent based on human emotions. Emotions, in turn, are essential in understanding how media messages are processed as well as media’s impact on individual and social behavior and public social life. Adopting an interdisciplinary approach to the study of emotions within a mass media context, The Routledge Handbook of Emotions and Mass Media addresses areas such as evolutionary psychology, media entertainment, sociology, cultural studies, media psychology, political communication, persuasion, and new technology. Leading experts from across the globe explore cutting-edge research on issues including the evolutionary functions of mediated emotions, emotions and media entertainment, measurements of emotions within the context of mass media, media violence, fear-evoking media, politics and public emotions, features, forms and functions of emotions beyond the message, and provide the reader a glimpse into future generations of media technology. This compelling and authoritative Handbook is an essential reference tool for scholars and students of media, communication studies, media psychology, emotions, culturalstudies, sociology, and other related disciplines. Döveling, Katrin, Mi kos, Lothar & Nieland, Jörg-Uwe (eds.) (2007). Im Namen des Fernsehvolkes. 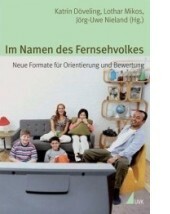 Neue Formate für Orientierung und Bewertung [In the name of the television viewing public: new formats for orientation and evaluation]. Konstanz: UVK Verlagsgesellschaft. Die Beiträge spüren dem Trend von Fernsehformaten wie Gerichtsshows, Castingshows und Reality-Shows nach: Sie analysieren die Formate exemplarisch und stellen Studien zur Rezeption dieser Formate vor. Dabei stehen das Verhältnis von Fiktionalität und Authentizität sowie der Nutzwert für die Zuschauer im Vordergrund.